At the suggestion of the Small Business Development Council, I contacted Inside Lacey magazine to get a plug in for the upcoming Timberland Regional Library Crash Course Clown Camp. The editor (“Centralized Publication Manager”), Pete Kennedy, replied asking me if I would be interested in an email Q&A, and that I should send 10 High Res pictures. Ah-hem. Yes. Here there are, and what are your questions? He sent two dozen questions and gave me 48 hours to answer them. The final piece included answers to 8 of the questions and all 10 pictures. What I had not realized what that they produce a sister magazine, West Olympia Life. For Inside Lacey, this became a featured article. 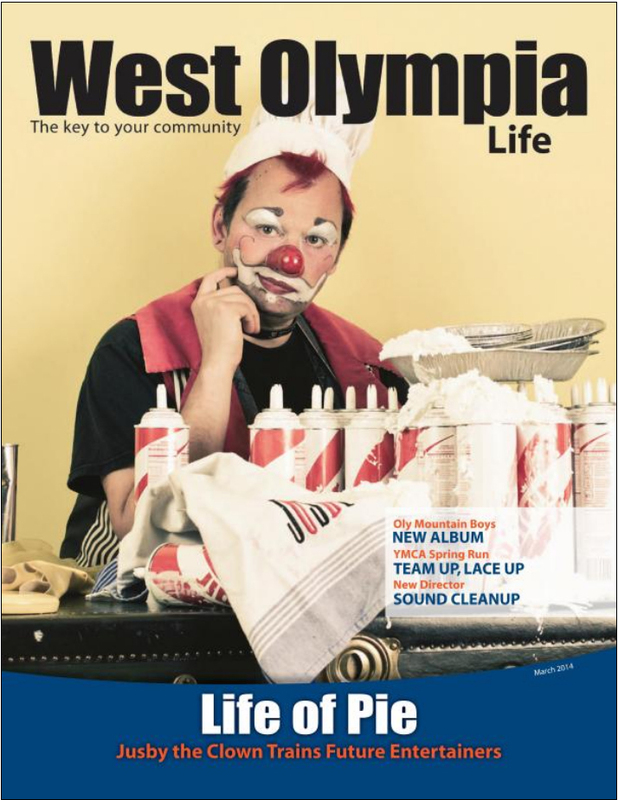 For West Olympia Life it was the COVER STORY! —You also have interns through Evergreen. How many interns have you had through this program, and have any gone on to be professional clowns themselves? I have worked with emergent clowns as interns and assistants and less-formal collaborations over the past few years because I felt the profession needed more in the way of apprenticeships. When I work with college students I have recommend texts and videos and expect reflective journals in exchange for my evaluation of their work. All my collaborators should expect a fair mix of show and business when we gig. One of my partners, Honey the Clown, now offers pie-in-the-face in New York. Posted on March 8, 2014, in :o). Bookmark the permalink. Leave a comment.